I never knew that Bob Graham had not read the 28 pages until he said it on stage. What is also interesting is the audience... such as mentioning anthrax. I don't know what to think about Robert Baer. He mentions the USS Liberty, but then again he says some "CIA type stuff" (non-answers, distractions, hyperbole possible lies, opaque). Anyway, I am not going to loan him any money. TomT on Tue, 05/31/2016 - 4:29pm. TomT said..."I don't know what to think about Robert Baer. He mentions the USS Liberty, but then again he says some "CIA type stuff" (non-answers, distractions, hyperbole possible lies, opaque)." Then what should we think of TomT? Since he was the Chairman of the Inquiry that produced the report the 28 pages came from, he not only has read them, he had a hand in writing them. No, he did the opposite. He confirmed on stage that he had read them. Of corse he read them, he was the Chairman of the Committee that issued them. jimd3100 on Wed, 06/01/2016 - 12:33am. I was wrong. Bob Graham helped to write the 28 pages. "Senator, I may have mis-characterized...the fact that you... ...I thought you had read the pages since they were generated by your committee. You ("haven't" or "have") read them, but like the priest in the confessional (chuckle) you can't tell us, but your daughters have read them and I understand that a lot of other Congress men and women have read them. And from what I have been told by the people who have read them, they say it has completely shocked them and changed their entire perspective on what has happened. Is that an accurate depiction of the impact that these 28 pages have had on those who have read them?" "Senator, I may have mis-characterized...the fact that you... ...I (had previously) thought you had read the pages since they were generated by your committee." "You haven't read them, but like the priest in the confessional (chuckle) you can't tell us, BUT ...(others have read them)". "I thought you had read the pages since they were generated by your committee"
My interpretation at the time of hearing this segment startled me. I was shocked to 'hear' that. So, in essence, I misinterpreted the words. I was wrong about Bob Graham. I have no problem being wrong. I have no problem being wrong, even though it seems that part of your intention is "to go after me" or "bait me" as seen on a number of other threads. 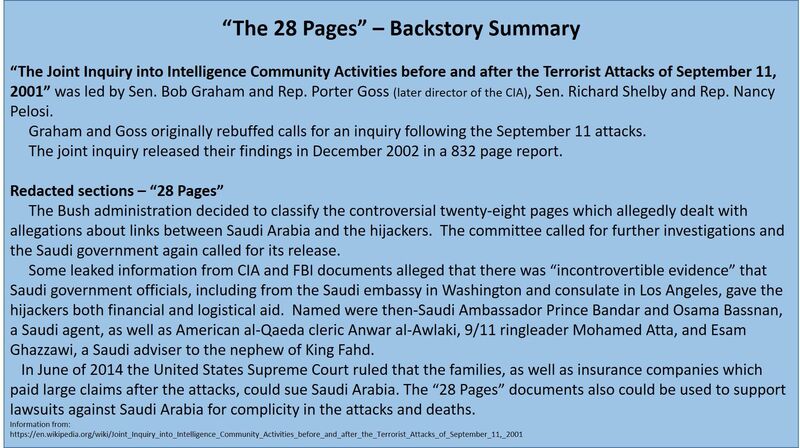 In fact, I am trying to prove myself wrong here... http://911blogger.com/news/2016-05-21/saudi-paper-us-carried-out-911-attacks#comment-263941 and have even emailed the source publication, but as yet have received no answer. -- Bob Graham entirely rejects any "Truther" claims, such as explosives used on the buildings. He states he is a complete proponent of the official story. -- The anecdote about Bob and his wife being detained and intimidated by the FBI in order to have him drop the idea of "calling for a release of the 28 pages". -- A highly important question was asked by Jerry Robinson: "WHY NOW ?" and Bob makes a number of points which he sees as to "Why now?" TomT on Wed, 06/01/2016 - 8:42am. At the "Jewish Community Center of San Francisco" Robert Baer talks about his role as a CIA operative. Without a doubt, Baer makes some good points about different issues, as he often does. In the video, he gloats about his ability to "lie" and to "misdirect" his entire life, a master at deception while appearing affable. His daughters were shocked to learn about his role in the CIA when he was on "60 Minutes". What is also interesting is that Robert Baer gets lots of play in the Press and a lot of support. ...The George Clooney / Matt Damon movie "Syriana" based on Robert Baer. I compare Robert Baer's limelight in the Press and book support to the support which Sibel Edmonds received. Sibel was suppressed by the government and media. Publishers don't really want to deal with Sibel. Where is her movie with a big name star? Robert Baer has a supposed acumen about Saudi Arabia. If he was "still on a 'payroll'" (whether by favors or by cash), he could be an asset, a public celebrity in order to portray a certain agenda. I can have an opinion. TomT on Wed, 06/01/2016 - 10:14am. jimd3100, Do you have a list of names / entities being sued? Do you have a list of names / entities being sued? Over the years the lawsuit has changed repeatedly. Some defendants have been dropped because of diplomatic immunity or because of some judicial ruling. I am looking for a list of names and entities (both current and also the ones which were dropped from the lawsuit). You seem to have a good grasp of things related to the 28 pages. TomT on Wed, 06/01/2016 - 10:37am.